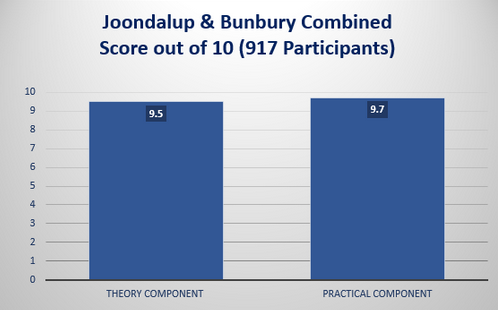 Based on asking almost 1,000 Edith Cowan University (ECU) students who completed our Student+Safe training (Basic Life Support/Manual Handling) we have received a score of 95% for our online courses and 97% for the practical training! I would like to take this opportunity to thank you and Intellilearn for yet another stellar semester of providing manual handling and Basic Life Support (including CPR) to our students. We have found your service to be professional, clinically relevant, based on current evidence based practice, efficient and targeted to meet students’ needs at all times. You are extremely well organised with both the booking and running of the courses and are always available to students and adaptable to their needs which certainly makes our lives easier. The feedback we receive from student’s is always positive and in particular they appreciate the clinical relevance provided in the hands on training sessions that enables them to see how it could really occur in the clinical setting and hence how they would respond. Furthermore, the lecturers who attended the courses were highly impressed with the content covered and the knowledge of the educators. Another thing the students feedback about is the highly competitive cost of the course as well as the ease of completing the on line theoretical component. 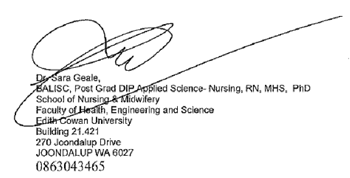 The administrative staff member here who processes all of the students practicum mandatory requirements, including manual handling and BLS, has also provided feedback that the certificate provided is easy to understand and meets all of the required elements, meaning she does not have to waste time contacting a provider to confirm any details. Every element of the service you provide is outstanding and we look forward to many successful years ahead of working with you which is an absolute pleasure at all times. I would like to thank your group for the time and energy that you have input into supporting the staff and students acquiring and updating their skills in Basic Life Support, Manual Handling, and Medication Calculations competency. Having personally attended the BLS and Manual handling courses I am impressed by the quality of teaching and by the organization that goes on behind the scenes. It is certainly no small feat to deal with the number of students and staff that you support by providing this training. However, you do it very well. Your emphasis on patient and provider safety along with the development of proficiency in the required skill sets is an echoed in the classroom and follows the latest evidence based practice. With this approach we are assured of better outcomes in the clinical areas and the community. I would also like to take the opportunity to thank you for the MED+SAFE Medication Calculations teaching and testing online program. It is an exemplary course and I can honestly say I have not seen better anywhere. Intellilearn has managed to focus in on three areas in healthcare that can improve safety for the health care provider and the patient. Improving medication administration, response to cardiac arrests and moving and handling techniques are global issues. With IntelliLearn efforts in these areas, including the product they provide and the professionalism of their administrative and their teaching staff we will surely see an improvement in safe practice in healthcare.